Asura Cave Temple is nested in a cliff above Pharping in the southern part of the Kathmandu Valley. 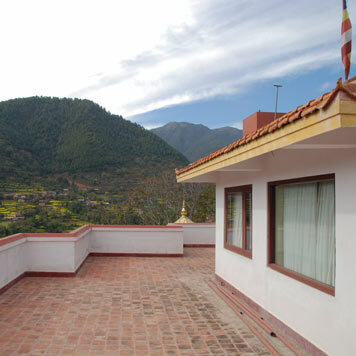 The cave has an ancient history as it was here the tantric master Padmasambhava attained realization. To fulfill the 16th Karmapa’s wish, Kyabje Tulku Urgyen Rinpoche and later his son Chokyi Nyima Rinpoche developed the area around the cave to house traditional three-year retreatants, pilgrim guests and other short-term retreatants. In addition to pilgrims and retreatants, many elderly people come here to spend their last years cultivating love and deeper insights. Before officiating the consecration of Ka-Nying Shedrub Ling Monastery in 1976, His Holiness Karmapa Rigpe Dorje had previously once visited Nepal, when he requested a long-life empowerment from Kyabje Tulku Urgyen Rinpoche. 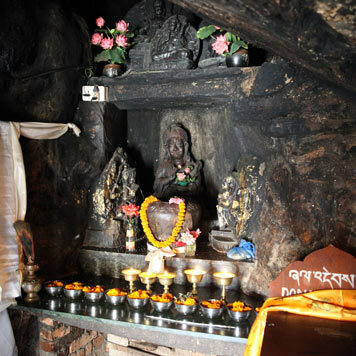 Rinpoche decided that the Asura cave would be an ideal place for such a ceremony. 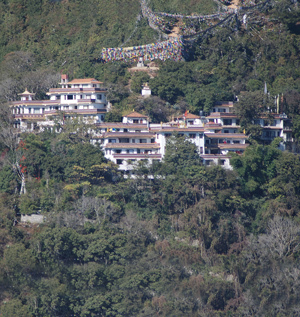 The temple at Asura Cave in Pharping serves as the three-year retreat centre for the monks of Ka-Nying Shedrub Ling Monastery. There are also facilities available for individuals to stay in retreat in a quiet and sacred environment.